I am curious about what momentum could possibly mean. I think pundits are trying to capture the science-y mojo of Newton’s First Law, an object in motion tends to stay in motion. An object with this tendency has “momentum.” If so, they might mean that when opinion is moving in one direction, it will keep moving that way. And Dickerson reports seeing a high level of energy at Romney rallies. However, that energy does not imply that Romney’s support is growing. His supporters could be enthusiastic but stable in number. I note that even that is not true, as evidenced by the recent EV history (see the top of this post). I said that Romney peaked on October 13th. That was based on state polls. But he might have peaked as early as October 5th, as based on national polls, which are done more often than in most swing states. As I wrote on Sunday (“Anatomy of a bounce,” October 21), Romney got a 5-point bounce within a single day of Debate #1 – and it’s subsided a bit since then. It is certainly true that Romney supporters are far more enthusiastic than they were before Debate #1. This may account for why the race has not bounced back to where it’s been since June, an average of Obama +3.1+/-1.3% (measured through Electoral College mechanisms using the Meta-Analysis). Today, the Popular Vote Meta-Margin is Obama +1.8%. His November 6th re-elect probability is 90%. To the extent that I anticipate change, it is in the direction of President Obama. That much is apparent from the recent history. Finally…lest you think that I have it in for all pundits, here is a nice piece by Robert Wright. It captures the current state of the race very well, entirely in words and with no math. From 299 EV to 290 in a matter of hours? This is making me dizzy. Just when I’m ready to spread the good news, the numbers drop again! I didn’t catch the MM this morning but Sam mentions in his piece that is 1.8; I just checked now and saw it at 1.48. The national polls except for Gallup seem to have improved; the state ones including purple seem decent; what caused this big drop…and are we to now negate all the positives said in Sam’s early morning piece here??? Eh, it’s back to the “flat as a pancake” situation I was talking about early this morning. I’m not convinced there’s going to be a lot of motion toward Obama from here on, but getting scared by the noise at this level is really not healthy. First off, national trackers don’t matter in this model. “The 3pm drop was caused by a number of things. Two new polls were added to Pollster for CO and NC, but apparently the datastream for the model only included one for each state. Instead of CO being O+3 and NC being R+1, we got CO at O+2 and NC at R+3. This should sort itself out in time. Some glitch in the data caused VA to move from R+0.5 to R+1. I don’t know why, but I’ve seen this before. The Purple Strategies polls were on Pollster, but didn’t make it to the data used for the 3pm update. They should move OH to O+2 and VA to a tie. Les: Read upthread a few comments and you’ll see the reasons for the MM movement discussed. But remember, it’s going to bounce around from update to update, and such bounces shouldn’t be cause for concern or alarm. If it were to slowly drop into the 0-o.5 range over the next week, then the election will be truly a horse race. mm 1.8 to1.4 thought it was suppose to go for obama.dizzy is one word.im staining my pants. Why does the EV prediction at the top of the page change when I switch from home page to the EV/MM history page, and which one is the actual prediction? Didn’t Steve Mcmahon say “a bunch of swing state polls” yesterday? Is his idea of a “bunch” 3? And didn’t he also say that O was up in ALL of them? What’s the deal with this guy? Is he clueless about his own polling or what? Maybe he got a call from Rove and company. Can you image what type of conversations some of these polling companies are having with the powers that be? Hey you know some of the campaign $ is going to Swiss, Costa Rican and Cayman Island accounts. Steve M. is a Dem. Why would he care about Rove? Martin it was a sarcastic response. In addition to the 3 individual states, they did one large multi-state poll, that covered Nevada, New Mexico, Colorado, Minnesota, Iowa, Wisconsin, Ohio, Pennsylvania, New Hampshire, Virginia, North Carolina, and Florida. Over that broad group, Obama is up 2. So that’s probably what he was referring to. CNN’s polls seems to have been noticeably R biased, at least in the later parts of the campaign. 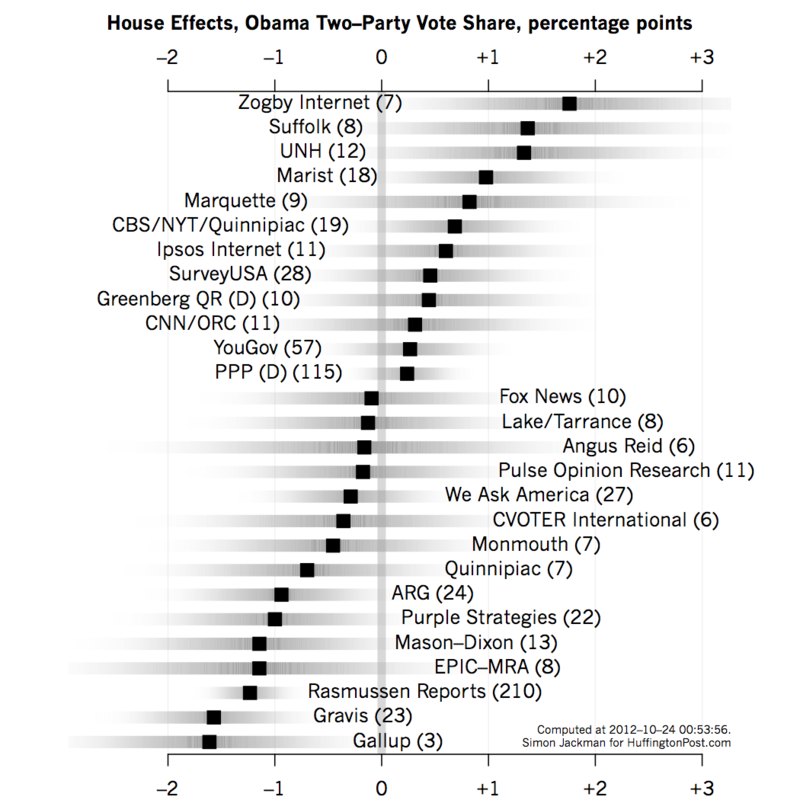 Does anyone have any data on that–is there a “CNN house effect” that skews toward R, and if so, what is the size of it? Based on Pollster/Huffington Post’s method (and I think they were just looking at departure from the average, CNN/ORC is about +.5 Dem lean for house effect. “CNN house effect” is better known as “CNN Administration Effect” last seen when announcing the complete opposite of reality that the SCOTUS ruling on the ACA was. For a full eight minutes! Help! I’m being crushed by Ro-mentum! To what can I liken it–it’s like a deluge of bodily waste that’s expelled from the rear end of a male cow. So if CNN’s OWN POLLING operation showing Ohio at O+4 doesn’t get them to start changing their narrative from Romentum…nothing will. Wolf Blitzer just said it was a tie on tv. I wish I was kidding. Wolf Blitzer is an android sent from the future to aggravate me. Don’t anyone DARE badmouth Wolf. He is the most graceful host to emcee the Soul Train awards! CNN (Blitzer show) was calling the four point Obama lead in Ohio a tie. If Romney were four points ahead, I think the narrative would be different. If Wolf Blitzer were a sportscaster, he’d report that the San Francisco Giants tied the Detroit Tigers 2-0 last night. The World Series now stands at SF 2, DET 0, which is within the margin of error. According to Wolf & CNN the last Super Bowl is still tied! No clear winner with the New York Giants slightly ahead by 4 points within the margin of error!!!!!!!! I went to the CNN website and looking at the comments was funny/sad. Many people saying of course it favors Obama, considering that CNN is part of the liberal media. Several people countering CNN’s numbers by citing the “unbiased” polling of Rasmussen that assures them of a Romney victory. It’s just nice to send trendlines confirmed. Additionally, I know CNN isn’t a “better” poll, but it’s going to have a better ‘known’ factor than ARG, Lake Research, SurveyUSA, etc. It’s going to knock the OH median up to 2% though. Yay, MM at 2.04. But for how long, how long? “n/a” means out of the table. As Steven notes, the MM should continue to bounce up and down. I have been wondering something about the media and it’s fixation on the race being a constant toss-up. I don’t know if this is possible, but I would love to see a study comparing how much advertising dollars and/or ratings increase for news networks if the race is close. Seems like a blow out would be bad for buisness. So glad I found this site to compliment my 538 obsession. Here’s hoping both continue to give me something positive to see in between the chaos of the TV reports. TJ, I too, was obsessed with 538, and I began using this site as a supplement to my addiction. Quickly, however, I moved on to Dr. Wang’s site as my principal election fix, and now Mr. Silver’s calculations are nothing more than an occasional indulgence. I like the MM algorithm as opposed to the 538 baseball-derived monte carlo simulation. I think that state probabilities are not independent of each other. 538 will give a good prediction anyway, but with a lot more computation and a much wider reported margin of error. Does anyone else have something to add about comparing quantitative algorithms for electoral vote prediction? … I just learned a lot more about the MM by reading the FAQ and linked articles. Yay. The gold standard of polls is using Live Calls…! Gosh darn it! Stealing my thunder! Haha! Again, it appears that for every 10% of the electorate that is cell-only, Obama’s margin increases by 1%. In Ohio, cell-onlys are 33% and cell-mostlys are 18% per the CDC. Hello everyone. I’m John Dickerson. Sorry to be late in joining the party. I was flying back from Ohio and have the chance to sit still for a second. I see that instead of characterizing the battle over momentum, I’m now a player in it. The piece that is the focus of Dr. Wang’s analysis had more modest pretty modest aims (just 6 paragraphs). I was trying to write a short scene piece about a day with Romney. That’s why I used a dateline, which I don’t normally do, and which we wouldn’t put on an analysis piece. Also I used a scene in the lead and kicker which wouldn’t be expected in a piece looking at the polls. So I was trying to explain what I saw that was new which was that a candidate who was once a vessel for anti-Obama sentiment is receiving reactions that are different than before. To the extent that the rallies are more intense and pro-Romney (rather than merely anti-Obama) I thought that was notable. This kind of scene reporting is really subjective and gives you a flavor for the race more than the direction in which it is heading. That’s why I tried three different times in the piece to say that everything that I was recording was possibly meaningless to the final outcome. That’s why I mentioned the example of the McCain Appleton, Wisconsin event in 2008. He lost the state by 14 points and lost all three counties Appleton touches. The use of momentum in the headline was probably misleading in the context of the current debate and the goal of the piece. To the extent I was thinking about momentum at all I was thinking of it in the way it works in clashing billiard balls. Two balls can have momentum at the same time, one more than another. So Romney can have Republicans coming on board and more intense than ever and since that’s an improvement relative to his previous position he has momentum. Obama is banking lots of early votes, and they appear to be low propensity voters, so he’s got momentum too. It also seems possible to be possible to have a race in which no one seems to have momentum but one will be a clear winner. It’s also possible to have a period where Romney has momentum– say after the first debate– and Obama still had lots of advantages that would allow him to win which would mean no momentum but a clear lead in the race. Thanks for taking an interest in my work. If you want, you can read it here. Sometimes the headline and subhead can squash the piece a bit so it might be worth reading it all to see if there are other ways in which I erred. Have a good weekend everybody. John! How exciting to see you here! 1. I think your posting here is awesome. Kudos. 2. I understand your points on subjectivity and color. I agree that what you’ve seen should be part of a narrative. 3. I I think that a primary objection is with your use of the word momentum. I think there has to be a way to show the effect you noticed without implying that the race is actually moving towards Romney, which is quantitatively and verifiably false. 4. I also think that your characterization of the Ohio polls as being ambiguous is something that the readers of this blog take issue with. 5. Do a lot of reporters read this site? I’d be interested to know! Good for you to come and answer the critics, even if I don’t totally agree. I think the headline was the killer though. Attention-grabbing, sure, but took away from otherwise would’ve been a fine “color” piece. It could’ve been worse, though. At least you weren’t Wolf Blitzer claiming a 4-pt lead in a poll is the same as a tie. so bien gentille of you to drop by. Isnt this a quote, Mr Dickerson? You *deserve* a drubbing at the hands of the quants. Man up, quit weasel wording, and take your lumps. I’ll ask you a serious question Mr Dickerson. Given the enormous amounts of money flooding these campaigns as to be utterly obscene. Does it enter your thinking that some of the monies might be greasing the palms of some of these Romney enthusiasts. Certainly there’s plenty of dough to go around. Also in thinking about this, I was wondering if reporting on ‘momentum’ is really the story. What about the voting machines? What about the voter supression tactics of the Rove crowd. Does Dr. Wang take into account the possibility of how Sandy could upset early voting turnout in NC, VA, PA, and even possibly OH? Curious. I know the variables are probably too numerous to probably fathom. According to Nate, “Obama’s up 2-3 points in Ohio per all polling aggregates. Historically, that sort of advantage holds up a LOT with 10 days left”. Unless, of course, you own the polling machines and can flip the vote in key precincts. Hard to discover since the total number of votes still add up. How fab to see the MM up above 2! This site makes me so happy, though I am *quite* addicted. A question: Does anyone here have any insight into how TPM could have Michigan as a toss-up state? If you look at their listing of recent MI polls on their Poll Tracker page, they show a tied one for today from a pollster I’ve never heard of (Foster McCollum, for Fox 2 News Detroit), then it’s O +6, O +7, O +3.7, O +5, O +6.7, O +3, O +3.45 going back to the beginning of October. What sort of aggregating process might they be using? Seems so bizarre, and counter what everyone else is showing (here, 538, HuffPo). Sa – first, huge props on a great site (from another quant-ish guy). I don’t know if your database is set up to do this, BUT after the election it would be awesome to watch a time-lapse animation of your red/blue map over the last ~4 months, along with dates/events. Glad to see I’m not the only one watching CNN with a dazed expression… Its too bad Ted Turner is gone from there. He wouldn’t stand for these games. I just wonder how idiotic they look. Cnn has become pitiful. Thanks to John Dickerson for giving some insight on that piece, and having the grace to do it on a site where he was getting some heat. He’s not the first to be hoist by a headline writer, and I do think it was more of a snapshot than making a case for Mittmentum. And as a fan of the show, I’d also recommend the Slate Political Gabfest, where John sticks up for all of us poll junkies. I would prefer an admission that HE WAS WRONG over weasel words and blaming his editor. If one prevaricates and spins in Slate, then one deserves an evisceration by the quants. And that’s what he got. C’mon, you guys were bemoaning the awful quality of pundit math. sic semper innumerates, gut-feelers and horseracers. How embarassing! I just checked my math, and in the case of victory in Colorado by fiat, Romney would need Ohio and Virginia or Ohio and Nevada, New Hampshire, and Iowa. Even better! The MM went down again by .08! The agony! And we lost 2 Ev’s!! So what happened? The 5pm update apparently had the median wrong. The last six polls are O3,R2,R2,O3,O9,R1, and med(O3,R1) = O1. Hey, it’s a just minor change in the MM. Doesn’t even deserve a *single* exclamation point. Hmm. I was replying to Reason’s panicky question about the drop in the MM and EV with the 8pm update. That comment seems to have been deleted. I think Reason is engaging in performance art at everyone’s expense. Nates Nowcast is 78.6 for Obama’s win prob. Hes being brutally flamed on twitter. Live by the model, die by the model. Dr.Wang. Sorry. It was. I thought it was obvious it was sarcasm mixed with mock panic. On the ‘tubes, it doesn’t take that much to make for an Andy Kaufman routine. I have come to realize that emoticons are in fact useful. Not that I encourage such things. I think we should go to the Twitterverse and back up Nate. you do it. hes getting his just deserts imho. all those conservos like Jay Cost and Sean Trende thought Nate was their *friend*. Nate’s friend is his model. Who cares, the nowcast doesn’t matter. The forecast is the one that he’s always claims is much more important since he started doing this. I wanted to humor myself a bit by watch both Fox and CNN’s electoral map analysis. I wonder if they are eligible for the TV Emmy for comedy. There was a lot of good comedic acting of the fiction script that they were blowing out. It’s all about getting people to tune in. Especially on Election Night. I think it is safe to say that come Nov. 7th, Nate and Sam will either be very famous and praised, or Karl Rove will have them “disappear”. SW, I hear you. But I have seen so much panic on here that I just could not resist the snark. It breaks the tension. I think you will agree we all pretty much have a horse in this race and we know which one we want to win. Despite the rational science regarding it. And I hate emoticons. OV, oh yeah. Needless to say, I will not watch CNN, MSNBC or Fox on election night. I will either look on the net, or watch CSPAN. FYI, Charlie Cook seems to be doing the same thing Dr Wang and Nate are doing. Following the state polls alone and counting the EVs. Wheeler, I do not see any negative comments on Nate’s twitter account. Just that he will be on Bill Maher tonight. Which I am about to watch. Wheeler, man. What did he do wrong? But, okay. im still pissed that he pulled the “oversampling post” on orders from above and never replaced it. And this whole season he’s been all “if one hand, then the other”, he NEVER mentions the demographic timer, and hes all that about both sides dooo eet. He’s more worried about making bank for the grey lady than anything else. so every time the model edges over the 70% threshold theres a conservative freakout. Jay Cost, Sean Trende, etc, have had twitter fights with him. The conservative b-listers also. So now he’s married to the model. Hes largely removed his economic indicators that were just adding noise, so the nowcast is converging with PEC and votamatic. How do you know they just add noise? And wouldn’t it be more accurate to say that the model was designed to phase out the economic input asymptotically up to the election instead of saying “hes largely removed” it? we have discussed artificial uncertainty here beacon times. What “oversampling post” are you referring to? what did he write in the post that had to be taken down? My reply didn’t survive moderation for some reason, so here it is again: Perhaps there’s been a robust discussion of the information content and bias of various metrics here, but I haven’t seen it – just assertions. You could for example point me to a measurement of the usefulness of polls vs economic models across elections as a function of time to the election. From what I understand of the 538 model you’ve just misrepresented it above, so I’d like to see a bit of peer review. Wheeler, okay. But I think someone said it on here before, he turned a hobby into basically a career. So I get your point about him “selling out” so to speak. I still like him. Even when it was just his personal blog. Now that I found this site, I just follow this and check Nate’s now and then. I find it interesting that now, his analysis is similar to Dr Wang’s at this point. Just stick to here for the sanity and go to the pundits sites Lib or Cons, for the laughs. He scammed the conservos, not me. They thought his pseudo-egalitarianism would extend to the model forecasting. He is getting exactly what he deserves for stringing them along for page clicks. @wheeler I read that hit piece by Jordan yesterday. It was funny. His basic argument was “Nate is wrong because I do not like his analysis”. @wheeler, k. But I just want to see what they are saying on twitter. Can you post a link? Reason, make an account. its painless and free and an infinite source of hilarity. Unskewed is attacking Nate currently. I have a question, for the statistically challenged like myself. I noticed at the top of the blog under the projected EV for each candidate that Sam now lists the probability of re-election in 2 percentages; Random Drift, and Probability. What does Random Drift mean? Since this is the snark thread, I just have to beg a dispensation from Dr. Wang to post this partisan snark. when poll aggregators collide, lol! Probably the wrong place to post this but, (1) Romney probably has acceleration as opposed to momentum, since we expect both campaigns to accelerate as the big day grows near. (2) O has momentum and Dr. Wang is right but, Sandy is gaining momentum each hour as a relevant variable in the equation. Black Swan analysis? Everyone is worried about having extra batteries for the storm. I wonder who is checking back up power sources for the computerized voting system we have been stuck with? I mean those machines do plug into the wall socket don’t they? How do those machines hold up under water? I observe that the Median EV Estimator has been fluctuating between one and two percent. Contrary to expectations, it has not returned to the mean, but settled about where Obama’s pre-debates low was. Comments?